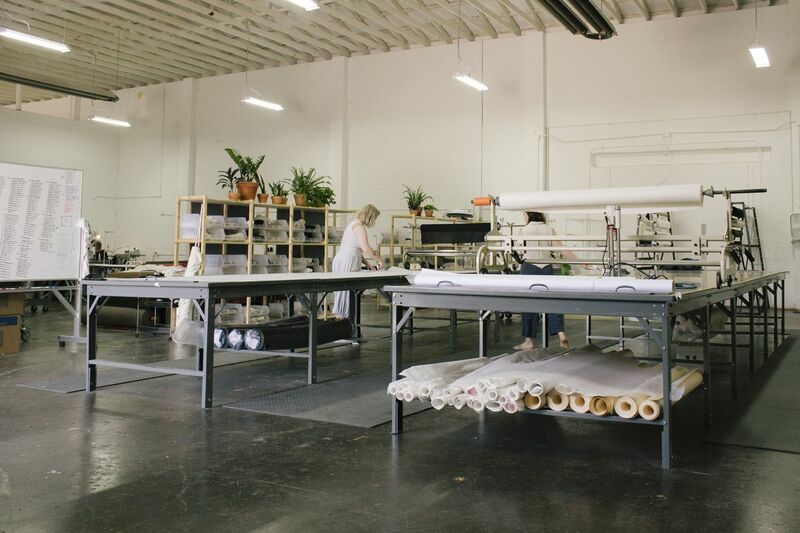 One small business owner gets candid about the real costs of running a clothing label — and why you should care. Racked is no longer publishing. Thank you to everyone who read our work over the years. The archives will remain available here; for new stories, head over to Vox.com, where our staff is covering consumer culture for The Goods by Vox. You can also see what we’re up to by signing up here. On Monday, Liz Pape, founder and CEO of Nashville-based clothing label Elizabeth Suzann, posted a story to her company’s blog titled “Money Talk” that, well, got a lot of people talking. 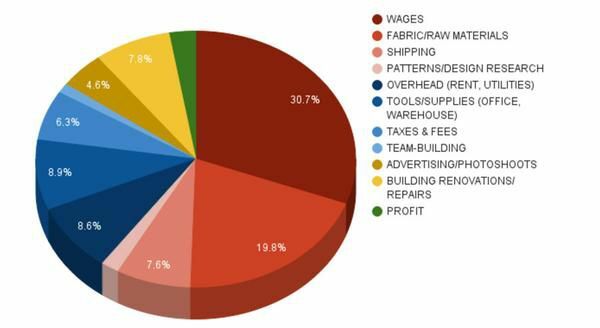 And if you think you already know what we’re talking about here, Pape goes way beyond the typical direct-to-consumer marketing disclosure, which might tell the shopper about cost of materials and cost of labor and shipping. She breaks it down even further — complete with charts and hand-drawn infographics! — explaining why the profit margin on one piece of clothing is so far from the full story. Reading the piece and then watching the conversation develop around it, we at Racked had so many questions. We wanted to get Pape’s TL;DR on the blog post and find out why she felt that now was the right time to open up the conversation with her consumers. We wanted to know more on why she thinks other brands are so hesitant to even go there. And we wanted to hear more of her thoughts on how we as a culture have arrived at a this place, where clothes have been so devalued that you can pick up a new outfit for the price of a Big Mac. Pape sat down for a phone call with us on Tuesday to talk through all that and more. Here’s what she had to say. The design room at Elizabeth Suzann. Racked: For our readers who haven't heard of Elizabeth Suzann and might not know what you guys are about, could you start off by telling me a little bit about your brand and its mission? Liz Pape: So I started the company in August of 2013. Our general mission is obviously to create women's clothing. We often get called a basics brand, but we definitely don't consider ourselves that. We predominantly focus on making long-lasting garments. Long-lasting in terms of both quality and durability, but also in style. They end up being pretty simple for that reason, but we don't intend to make basics. We also hope that those pieces are meaningful purchases in terms of inspiring and being able to help express their identity and all that kind of stuff. I wanted to talk about why we as a culture now have this fascination with price for clothing in particular, and not necessarily in other areas. Just as much as we care about the products that we make, we really care about the process behind making them. They've always been made in-house. In the beginning, I sewed every piece myself. We are still completely made to order. Every time an order is placed online, that garment then goes to the production process and is sewn only after a customer buys it. And all this happens under your roof in Nashville, right? I think most people have a general understanding of how clothes are made, but how different is the typical process at a big clothing company like Gap, and even the production process at a smaller, direct-to-consumer company like Everlane, from what you guys are doing? It’s a big struggle for us to explain exactly how different this is. We often get called a made-in-America brand, but we are not just that. We are, essentially, if you took your artisan, local business where you envision someone working and making products by hand and producing them on their own — that is essentially what we do, just at a larger, more efficient scale. 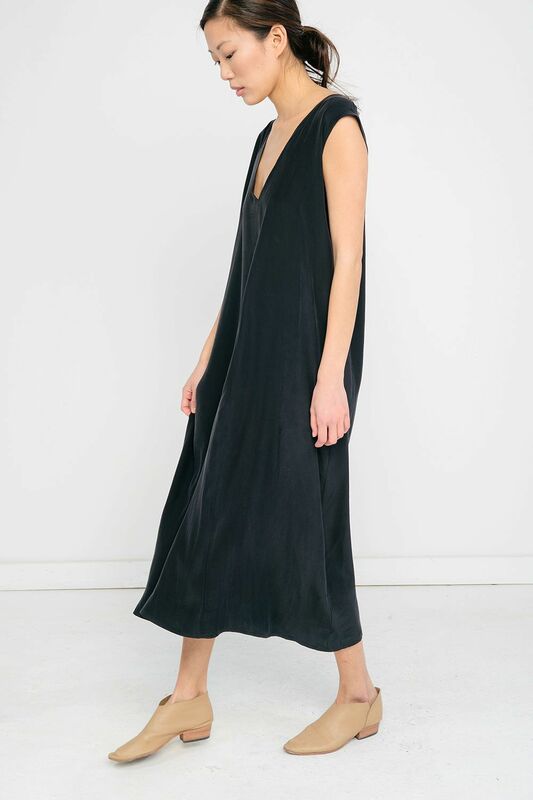 To kind of discuss the Everlane comparison, it would be as if their social media team or their customer support team were sewing their garments. Cutting fabric pieces that will become finished Elizabeth Suzann garments. Let’s talk about your blog post. In it, you dive pretty deep into the ins and outs of running a small business, especially one with such an atypical model. I’m going to suggest that everyone head over to your site and give it a read, but could give me the basic rundown of what were you trying to say with your post? What did you want the main takeaways to be? My first and foremost priority was to share actual information, so to actually inform our customers and readers how we price our garments. But I didn't want to have that conversation without setting up the context both before and after — why we even need to justify prices to begin with. And then I wanted to talk about what that price means in terms of affordability. Even though I think our products are very fairly priced, as are a lot of other ethical products in the market, they are necessarily out of reach for some. In closing, I wanted to talk about why we as a culture now have this fascination with prices for clothing in particular, and not necessarily in other areas. It's interesting to me that we're so fascinated with it, but I don't know if it is a healthy fascination. What made you feel compelled to share information and talk directly to your customers about money, pricing, and profit? Really, what spurred the conversation was the frequency of this topic in the industry. People talk about things being “overpriced” or wanting to know how much a thing costs to be produced, and especially with a lot of brands following in Everlane's footsteps and publishing how their items are priced or cost, it has stirred up conversation. I've held off on writing about this for awhile, because it's a hard topic to broach. It's really, really easy for things like this to be misinterpreted if you don't provide enough context. I wouldn't feel comfortable just publishing a simple infographic and having that be the end of the story. So what made now feel like the right time? We received a few questions near the end of year. I published an AMA that I did on Instagram, and in it we said that the price of some items may be increasing as we transition more of our fabrics to locally woven. We had a few comments that were really, really upset about that potential price increase. So I felt not a desire necessarily to address that concern, but an overall desire to talk in a broader way about prices and how they are determined. And then, more importantly, what that means for the company as a whole and how pricing is different from brand to brand. We need to think about the bigger picture and less about each individual product, or what kind of a deal that might be regarding its cost to produce. Why do you think clothes are getting cheaper while the prices for other consumer goods continue to rise? This is really a great question. I’m not quite sure how fashion got picked out of the bunch here. It's really been the outlier in terms of all the other things that we use and do that has not only stayed static in price while everything else goes up, but it's really drastically dropped. It's hard, it's kind of a “chicken or the egg” situation. Things have sped up. I'm not sure if the speeding up caused people to view their clothing as more disposable and less long-lasting, or if it was our desire for more and more stuff that led those big brands to start producing more seasons and more releases. I don't really know which came first, but I definitely think that clothing is getting cheaper because of the frequency of new releases. The big fashion houses are having multiple runway shows per year. There used to be two seasons a year, and now there could be ten or 12. That's trickling down into fast fashion. Obviously, as you know, we have brands that are reproducing the runway stuff days after it comes out. So we’re buying more frequently because new stuff is coming out more frequently. Therefore, we have less to spend on each piece because we’re buying so much. You mentioned consumers wanting to buy more, but are there other ways you think this has changed the way people shop? We're very used to buying a new thing for every event we have, or we're conditioned to not want to wear the same outfit twice, especially in a row. I don't know. 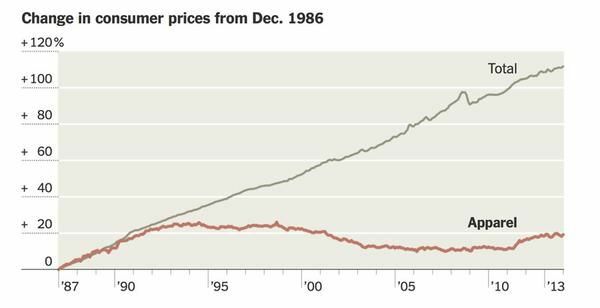 Maybe, idealistically, people used to shop this way, but I certainly think that consumption used to be more based on individual needs rather than price. I think it was more of an evaluation of “Do I need a new pair of jeans this year?” or “Fall is coming, a new semester is starting, do I need a new jacket or a new sweater?” and less of the buffet-style way of shopping — where you decide you want to buy something and then later you pick out what that thing is that you're going to buy. The only reason we've been able to think that way is because the prices have become so low. How is pricing usually determined for a product? How do you guys figure that out? Obviously, the two main things in pricing any product are the materials, and then the time or labor required to produce it. Then on top of that cost, you'll need to factor in some kind of margin for whatever business is making it to continue running. 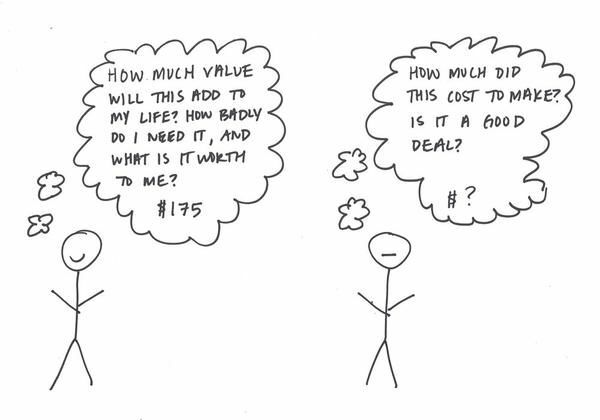 The traditional pricing model involves a couple rounds of mark-ups. The baseline price would be doubled in order to establish a wholesale price. Then that number would be doubled to establish a retail price, which is when you'd buy the brand at a store, instead of from the brand itself. We start at the bottom level. We don't really market in the way Everlane does, where we talk about not wholesaling and not having a middle man, but we don't wholesale. We exclusively retail through our site. 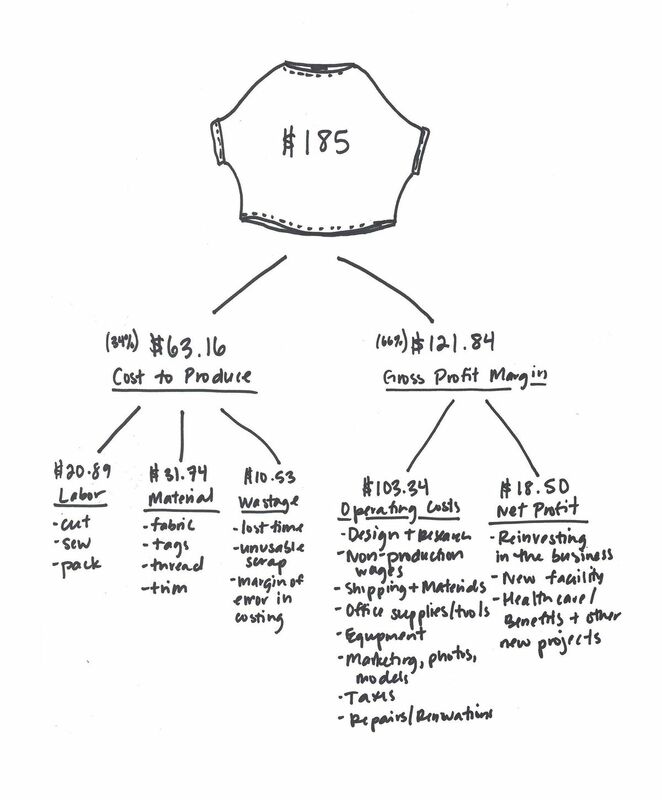 Pape’s breakdown of the price of her Artist Smock, which is priced at $185. We strictly consider material cost and labor costs, and then all of the other things we need to pay for to run our business. That has ended up anywhere between 40 and 70 percent. Some of our pieces have a higher margin and some of them have a lower margin. We balance that out based on what we think the market will bear, and also if we really want to make a product, but we know we're going to have to have a lower margin on it, our higher margin products allow us to still sell those things. For example, we make a shockingly low margin on our Harper Sweater. But I really, really wanted it to be in our collection, so some of our higher-margin items allow us to still sell that piece, because I believe in it. So we don't have a straight margin across the board. The artist smock in wool crepe, which I used in my illustration, has a 66 percent margin, which is a pretty standard piece for us. Clothing is really our most intimate possession, and the fact that we have relegated it to one of the our cheapest possessions is really, really strange. This is cynical, but I think a lot of brands don't necessarily respect their customers enough to believe that they could understand it. It's easy to fall into that trap to think sensitive information could be detrimental or customers might not really understand the whole story, so it's dangerous to share. Especially if they're run by board or are publicly traded, it can be really easy to assume that the masses won't understand that information and will misuse it. Then I think another reason is that it's not something that consumers will be happy to see. If the margin in 98 percent on a product, a customer probably isn't going to be really happy. They're going to feel ripped off. Yeah, that most of their money is not actually going into making the thing. That's probably why there's a little bit of both. It's not that easy to explain what it costs to run a business. It's really, really easy to compare and say, "How can it be that hard to do your accounting and ship stuff and put photos on a website?" It's hard to explain the nuances of your business simply, so there's a lot of room for miscommunication there; there's also probably some stuff that businesses don't really want customers to know. What made you feel comfortable just putting it all out there? Why did you feel confident that your consumers weren't going to misconstrue this info? It was definitely a concern, for sure. It was certainly a fear that it might be misunderstood or somebody might latch on to part of the conversation and miss the rest, but ultimately we have a really, really smart customer base. Our customers are really engaged and I trust that they're pretty intelligent and can understand this stuff, and more so will be on board with what we've put out there. You could imagine that a $185 top is really just lining our pockets, but the truth is that it's absolutely not. I also am very, very proud of how we run our business. I don't think that our net margin is at all unreasonable and every single penny goes back into the business and to pursue things that we're really excited about and proud of. Probably not publishing this until now, people's imaginations were worse than the truth in our case. You could imagine that a $185 top is really just lining our pockets, but the truth is that it's absolutely not. In our case, the truth was really, really palatable for people to see just how little we actually make on each garment in terms of real profit. I think that's kind of a comfort. The comfort there was knowing that the truth was pretty good information. You close up your piece talking about affordability versus the value we assign to clothes. Plenty of people might agree that $10 pants are harmful either for the person overseas making them or this price deflation across the industry as a whole, but that doesn’t mean they can afford the alternative. (On the other hand, as you mention in your story, 20 years ago it was a lot harder to find new $10 pants.) Can you explain a little bit about your stance there? This was the part I was probably most nervous to write. It's a really sensitive topic when you talk about anybody's money other than your own. I definitely didn't want it to seem like I was claiming that everyone could afford it if they just chose to make changes in their life. I definitely think that is not true, but I think it is true for a big chunk of us, myself included. But there will certainly be people who cannot afford to shop ethically in some areas, because it is simply out of their budget, regardless of any other circumstances. 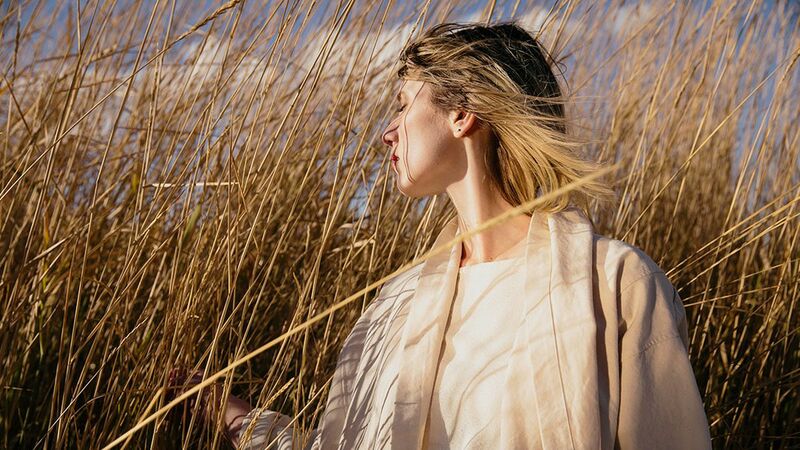 For most average consumers, particularly ones that are aware of ethical brands and are interested in that space, it would still require a pretty radical shift in perspective. It's going to be hard. We didn't grow up this way, at least most of us. We're very used to buying a new thing for every event we have, or we're conditioned to not want to wear the same outfit twice, especially in a row. It will require, first and foremost, a looking inward and deciding to be okay with those fears and a really, really strong and healthy level of self esteem to be able to decide to buy less and be able to decide to wear the same garment more often. Those are the big things that will promote affordability. It's just a change in shopping habits, but I think that change in shopping habits will need to come with a pretty big personal change, and won't be easy. We put a lot of self worth and we put a lot of value in our material possessions and having a lot of nice clothing, or frequently being able to buy new clothing. Even the act of shopping is a pretty validating one for a lot of people. Saying goodbye to that certainly won't be easy, but I do think that if you break down cost per wear, you break down your spending habits, most of us could afford to shop a little bit better if we bought fewer things and bought them less often, and also kept things in our closets for a long time, rather than refreshing our wardrobe every year. It's interesting to me, too, that clothes do seem to be this outlier where prices have gone down, but clothing is so deeply tied to personal identity and identity making. It’s what you buy to put on your body and show the world, this is who I am. Do you see opening up that conversation as the best avenue to making people reconsider these things — for you, is that how we shift the mindset? Yeah, I definitely think the conversation is step one. I wouldn't want to pursue any kind of pushy tactic, but just opening up the conversation to have people start thinking about their self worth and how it relates to how they dress themselves. It's such a good topic. It's such an interesting one to think about. It's a worthwhile investment to spend money on something that feels representative of your identity and makes you feel good. What was eye-opening to me was the kind of very, very simple and obvious fact that we literally wear clothes every single day. Our iPhones are in a pretty close second, but most of us have probably gone on a vacation where we said, "I'm not going to bring my phone. I'm going to leave my phone in the hotel room." But you probably didn't leave the hotel room naked. Clothing is really our most intimate possession, and the fact that we have relegated it to one of the our cheapest possessions is really, really strange. I'm not quite sure how that happened, but I think we can challenge that just by talking about it and trying to evaluate why, how we ended up here, and affirming to ourselves and to each other that it's okay to invest in yourself by spending more on clothing. It's not shallow and it's not wasteful. It's a worthwhile investment to spend money on something that feels representative of your identity and makes you feel good, and even more importantly, is not made from petroleum or isn't dangerous or harmful. We need to shed some feelings about what clothing is worth to us, but we also need to shed some fears about what other people will think of us if we "spend too much" on clothing, or are reckless with our spending by buying things that are higher quality, and so thus more expensive. Yeah, your point is that is not reckless at all.